Interested in having a global experience in your local community? There are many ways you can learn about another culture and/or another language locally! The two resources below list local organizations that offer opportunities to volunteer locally with fellow community members from different backgrounds, including the refugee community, the Latinx community and international students. I watched this Vietnamese man and his family cast their fishing net into Jordan Lake for hours. 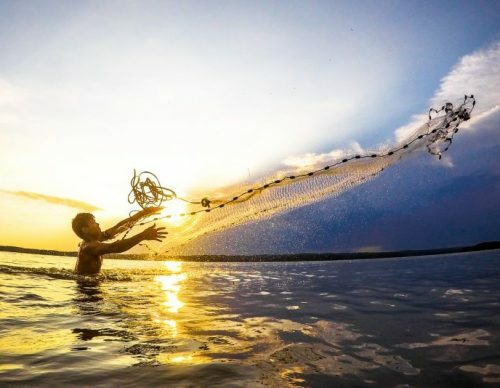 When I asked if they had caught anything, he smiled and said, “Not really.” As I watched, it struck me that the time he spent casting his net was more about tradition than catching fish. Don’t underestimate the value of local global experiences! They can be just as immersive, challenging and transformative as an experience abroad. Building trust, understanding power dynamics and exploring the complexities of culture shock are important for your own experience and the community with whom you will be interacting, so be thoughtful the ways you prepare for your local global experience. Approach the experience with humility, as a learner and not a teacher– even if you are literally teaching! Learn some phrases in the native language of those you work with. Try to identify some assumptions you may already have. Research the other culture(s) you will be learning about and make an effort to respect their practices and norms (i.e., consider how you dress, how you respond to their gestures hospitality). Please embrace this opportunity to learn from your neighbors and make them feel welcome and appreciated!